These utilities work under DOS, W3.1, OS2, W95, W98, Me, NT, W2K, XP, W2003, Vista, W2008 and W7-32. about current version. Abundance is a Forth-based business programming language, written in BBL Forth. BBL is a 32-bit DOS FORTH compiler. Distributed as is. See the warnings. This is not for the faint hearted. It would be of interest mainly to someone developing software for the third world where you need fast execution on old klunker XT and AT computers. You can write some very sophisticated data entry programs with it that will run circles around modern data entry programs. Also runs on the latest Pentium IVs. download BBL source and executable files. download GEN skeleton (class) library source files. download JPW Sample address book application source files. for the current version of BOOTSave/BOOTRest. Saves hard disk boot sector so that it can be restored if damaged or infected by any boot sector virus. 97K zip for BOOTSave/BOOTRest ASM source and executable files to run on your own machine as a standalone utility. Runs on DOS, e.g. from DOS thumbdrive, tiny DOS partition or DOS compatibility box. access bootsave source in repository with [Tortoise] Subversion client on wush.net/svn/mindprod/com/mindprod/bootsave/. download ASP PAD XML program description for the current version of BOOTSave/BOOTRest. BOOTSave/BOOTRest is free. Full source included. You may even include the source code, modified or unmodified in free/commercial open source/proprietary programs that you write and distribute. Non-military use only. for the current version of CMOSSave/CMOSRest. 125K zip for CMOSSave/CMOSRest ASM source and executable files to run on your own machine as a standalone utility. access cmossave source in repository with [Tortoise] Subversion client on wush.net/svn/mindprod/com/mindprod/cmossave/. download ASP PAD XML program description for the current version of CMOSSave/CMOSRest. CMOSSave/CMOSRest is free. Full source included. You may even include the source code, modified or unmodified in free/commercial open source/proprietary programs that you write and distribute. Non-military use only. for the current version of Restore. 138K zip for Restore ASM source and executable files to run on your own machine as a standalone utility. access restore source in repository with [Tortoise] Subversion client on wush.net/svn/mindprod/com/mindprod/restore/. 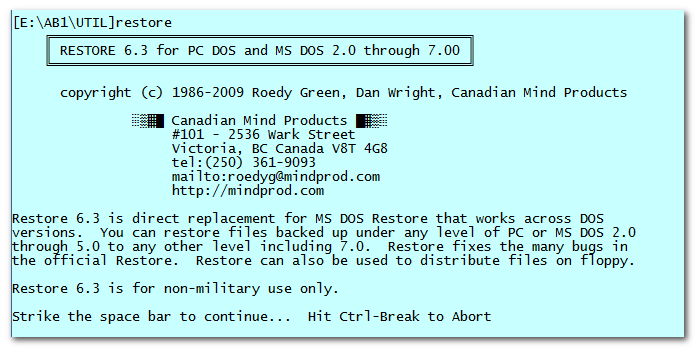 download ASP PAD XML program description for the current version of Restore. Restore is free. Full source included. You may even include the source code, modified or unmodified in free/commercial open source/proprietary programs that you write and distribute. Non-military use only. for the current version of Say!. Bat file ECHO enhanced utility to also emit control chars. Also includes ASM DOS version. 119K zip for Say! C source and executable files to run on your own machine as a standalone utility. Runs on NT, W2K, XP, W2003, Vista, W2008, W7-32, W7-64, W8-32, W8-64, W2012, W10-32 and W10-64. access say! source in repository with [Tortoise] Subversion client on wush.net/svn/mindprod/com/mindprod/say!/. download ASP PAD XML program description for the current version of Say!. Say! is free. Full source included. You may even include the source code, modified or unmodified in free/commercial open source/proprietary programs that you write and distribute. Non-military use only.